I am curious as to what brand of hooks everyone likes to use the best. Is there a better brand of hooks than another? I have different types of hooks, I have a set that I just recently purchased at walmart and I have only used the 3.5 so far but really dislike it. When I am crocheting amigurumi, I tend to hold the hook way too tight and while using this one I bent it and and to bend it back out. I believe that the name on this one is Boyle? Its kind of hard for me to read. Do you think its the brand of hook or maybe that it's a smaller size, making the metal softer? My husband bought me bamboo handled hooks by bates I think? I love these two hooks and use nothing else unless I need a size that is different that my 4.00mm and 6.00mm. Also what about material. Most of my hooks are metal, I have one that is made from wood. What is everyone's favorite hooks made out of. I don't think there is a single brand or type of hook that everyone would agree is best. Our hands and techniques are all different; also the type of yarn and stitch make a difference. Before i got these, my favorite hooks were Susan Bates aluminums from the 1960s-70s, that had been my mom's or my own back in the day. They were made in the US and they are just great hooks. Sadly in my opinion/experience, the Bates and Boye hooks that are made curently just don't have good quality control and I don't like them much at all. One thing to note about these hooks is that there is a marked difference in the hook shape, Bates are inline and Boye are not. if you look closely at yourBates and boye hooks you will see the shape of the hook tip is different. I personally always preferred the inline shape and found the tapered or pointed Boye shape difficult to use and it seemed to snag on the stitches. I think you must be crocheting WAY too tightly if you are bending an aluminum hook---seems this will injure your hands/wrists over time. But i haven't bought a Boye aluminum hook in decades, maybe the metal is not as sturdy as I think and is easier to bend now. It sounds like you enjoy the Bates bamboo handles so i would encourage you to get more sizes of those. I prefer Susan Bates hooks and fortunately have a lot of the older ones (made in USA), the newer ones are okay but I like the older ones. I don't care for Boye hooks, they seem to catch on the yarn and it doesn't seem to flow as easily as Susan Bates hooks do. It is a matter of personal preference, I agree. I also like aluminum better and will use the heavy plastic ones (like Crystallite) but only with the larger sizes (L and above). I also like bamboo, sometimes it depends on the project and yarn. Experiment and you will find the ones you like the best. But have fun, in any case. My favorites by far are Susan Bates hooks. I have tried others, but I always go back to the Bates. I have older hooks also, but a number of newer ones too because I always have a lot of projects in process. I prefer the Bates aluminum, but I was intrigued by the prettiness of the Crystalites, so I bought some. They are a bit harder to use because there's more drag, not the slickness of the aluminum. I do have a cherished wooden hook from a friend that I don't use often. Yeah.. the hook is really soft when it bends it is no trouble to just bend it back into shape. Not that I don't think I am crocheting too tightly... I have trouble holding the hook loose and am always doing my best to remember to do so. Lately I have been holding it looser I believe as my hands havn't been aching as much while working on amigurumi. I do the same thing when writing and have always done so. It's a concious effort for me to hold hooks loosely! Thanks for all your input. I might try the amour somethime, but I have a hook that looks like the Etimo and I don't like it. I was just curious as to everyones favorites. I figured they would all be different types and brands but it is still interesting to see what everyone likes. I think a lot of the comfort and preference of certain hooks depends on how one holds the hook. I hold mine like a pencil, and I much prefer a Susan Bates hook because it "catches" the yarn much better. I simply cannot get the yarn to stay on a Boye hook! Oh yes, Avon Lady, that's something I forgot to say! When I use hooks like the Boye, that have the rounder heads and shallower throats, the yarn constantly pops off the hook for me. Considering that I've been crocheting over 30 years, I don't really think the problem is really me. I've tried these types of hooks a number of times over the years, and I always have the same problem. When I change back to Bates hooks with the pointier head and deeper throat, the yarn does not pop off the hook like that. I don't have to stop to chase after every third or fourth st. My crochet is much faster and smoother. Yes, Real Deal! My sentiments exactly! A new member of our crochet group was having trouble keeping the yarn on her hook last week--I handed her one of my Susan Bates hooks--and she just went sailing happily along--no more problems! So it isn't just us! I'm a Bates fan myself and after finding the Bates Bamboo hooks with the bamboo handles and the metal hooks I rarely use anything else. That being said I really do think it really is an individual preference. I have fairly large hands and the wider handles of the Bates Bamboo makes them much easier to hold from the smallest thread hook to the larger sized hooks. I couldn't work with thread until I found them. I do prefer the Bates head, but I know plenty of people that swear by Boye's head as the only kind that works for them. This is why I always encourage people to buy one of a new brand you are interested in and try it out. Either through purchases or gifts I've been fortunate to try a number of different brands that I hear people talking or posting about and while they love them, most of them I just don't enjoy using and tend to pass them on to others who express an interest in trying them or adding to their collection. I do have a fondness for wood, but since I crochet tightly, I do find a metal head works better at pushing through the yarn. I think that's likely why I've stuck with Bates Bamboo. I have been disappointed that a few recent purchases have had faulty handles that have slid off. DH has glued them back together, but I am hoping it isn't a change in manufacturing that has caused the problem. I would love to hear from anyone with Furls hooks and their experience! Most of my hooks are Susan Bates. I have a few other mixed in, but those are my go-to. Love of a particular hook is as individual as each crocheter. Last year when I was looking for more comfortable hooks, I asked in here, at my yarn groups, and read everything I could on hooks. I found out that different people had different reasons for loving their hooks. 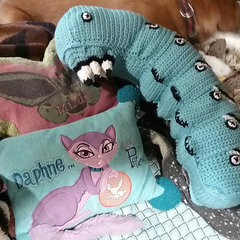 The main thing is if it's comfortable, stitches are easy and yarn stays on the hook, then it's the right hook for you. I usually use tulip Etimo but recently bought a Clover Amour and am in love with it. I can crochet faster and my arthritic hands don't hurt at all! As most have said, it's all about individual comfort and style. I learned on Boye hooks many ears ago and never had a problem with them, but now enjoy the more ergonomic hooks. I was dedicated to using Susan Bates Bamboo/Aluminum hooks until the first Clover-Amour hooks came out. They are almost all I use exclusively for thread and up through size J hooks. However, I do not care for the K/ size hook and larger because they are plastic. They're easy enough to use, but, I get the "squeak" with acrylic yarn. Ach! Drives me insane. The smaller than L/11 hooks get an A+ from me. It definately depends on how you hold the hook as to which brand is best. I absolutely cannot uses susan bates hooks. I have tried multiple times and I cant get the yarn to stop catching on the hook. It would take an hour to do a row of single crochet! With Boye hooks I sail right along. My father in law has exactly the opposite thing. He can only use susan bates. Funny!! hummm.. I'm using a set of REALLY cheap metal ones from the 'Chinese ebay' (taobao) since I wasn't sure how serious I'll be in crocheting, like $4 for the whole set of 12, from 2mm to 8mm. It's fine actually, but since they don't have handle, can be tiring for the fingers after a while. But they're still pretty good for newbies I think. I only have tiny hands so I I don't like big cluppy, and heavy items same with my cultery. So can't get on with the Clover ones that have the thick handles. I tend to use old retro hooks I bought as a teenager in charity shops they are all Aero They are light not bulky and very strong, lasting for years and years. I've tried bamboo but find them not as strong.